When Levon Helm passed away on April 19th in 2012, thousands of friends, neighbors, and fans filed past his closed coffin, and hundreds lined the streets of Woodstock, New York, as a Dixieland processional marched to his funeral. He was laid to rest next to The Band’s bassist, Rick Danko, who died in 1999. Part of Route 375 in Ulster County has since been designated by the governor as Levon Helm Memorial Boulevard. In his final years, despite being diagnosed with throat cancer, Helm never lost heart. His solo career began in 1977 and he had an amazing revival over the last several years. His success came as much from his skills as a singer and songwriter as from his brilliance as a drummer. He won three Grammy awards: Best Traditional Folk Album 2007 for Dirt Farmer, and two for Best Americana Albums, one in 2009 for Electric Dirt, and in 2011 for Ramble at the Ryman. That last album kicked off the idea for a series of what Helm called “Midnight Ramble” Sessions at his studio in Woodstock, where he held informal public performances featuring a stellar lineup of guests such as Jackson Browne, JD Souther, Maria Muldaur, and Donald Fagen. Top session musicians like Anton Fig and Tony Levin also joined in, as well as Helm’s own band and others, including fellow Arkansan Billy Bob Thornton and the Boxmasters. The film Ain’t in It for My Health at the Museum of Fine Arts chronicles his struggle with a medical diagnosis of throat cancer and his efforts to continue singing with a voice damaged by radiation treatment. As the title implies, Helm regretted neither his career or his cigarette habit. Helm is old, and he’s tired, but he keeps on ticking. His folksy ideas about life, the anecdotes he shares, and his reverence for American music and for the friends and comrades who gather around him, are inspirational. The Band was like many acts where one songwriter claims publishing rights to a group’s sound: the Young Rascals, Orleans, and Boston come to mind. Thus leader Robbie Robertson profited the most. 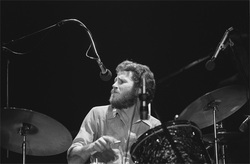 Nevertheless, as the only American in the group, a case can certainly be made (and is alluded to in the film) that Helm’s background, life, and Southern roots played a significant role in creating The Band’s sound. Helm’s distinctive voice had a gravelly, emotional quality that was rooted in his Arkansas upbringing, a style that hovered somewhere between the blues and a country twang. Robbie and I worked on “The Night They Drove Old Dixie Down” up in Woodstock. I remember taking him to the library so he could research the history and geography of the era for the lyrics and make Gen. Robert E Lee, come out with all due respect. It was another one of those workshop songs we worked on a long time before we got it down. This was when we started halving the beat on a lot of tunes, which gave us a distinctive thing. Instead of keeping full time rhythmically, we found if we halved the beat we could lay the lyrics in a different place, and the pulse would be easier to move to, more danceable. As a professional drummer myself, hearing Helm was a revelation in 1968. Drummers learning their craft during the 1960s gleaned ideas and grooves from the great stylists of the day, including Hal Blaine, DJ Fontana, Clyde Stubblefield, Ringo Starr, Charlie Watts, Larry London, Al Jackson, Mitch Mitchell, and Dino Danelli. Helm’s drum patterns seemed to come straight from his heart. The herky-jerky syncopation of “Look Out Cleveland” or the unpredictable funky conversation between the snare and the bass drum in “Cripple Creek” were new. (“Rag Mama Rag,” with its asymmetrical groove, has Richard Manuel on drums.) “The Night They Drove Old Dixie Down” features a beautiful three-beat press roll that is followed by a breath on the fourth beat before launching into the chorus. Untrained, filled with Southern soul and imagination (a mandolin player as well), Helm opened up possibilities about how a drum set could be used to sparingly, but powerfully, accompany a variety of acoustic instruments as The Band experimented with and rediscovered the sound of American roots music. Once, many years ago, I had the opportunity to play on Helm’s classic old wooden set at his home in Woodstock. They were tuned surprisingly low, and seemed to resonate upward. It was a bit of a surprise, but of course I didn’t dare tune them. That was Levon’s sound. Robertson went on to a mature career as a producer and composer for film. After several bankruptcies, the brilliant keyboardist Garth Hudson is a producer and keeps a low profile. Rick Danko and Richard Manuel, charismatic and a significant part of The Band’s sound, died young after years of problems with drug and alcohol abuse. But Helm survived, remaining true to himself and his roots. He worked as an actor in over a dozen films with rave reviews for his performances in Coal Miner’s Daughter and The Right Stuff. Like all the members of the group, he also struggled, but he eventually embraced and then celebrated his remarkable history. Together with his daughter he toured to the end, embodying the spirit and energy of the roots music he so loved.